I missed this, but the Angels signed him to a minor league contract. But I'm going to make an exception on this one - largely for the newly-drafting leagues for 2018 - and Ohtani is now in BWB player list. Ohtani is eligible as both a pitcher or hitter. For 2018, it will work this way: you'll need to pick a spot for him at the beginning of any week and he'll only count as just a pitcher or just a hitter - depending on where you slot him. This may change in future seasons, but that's the plan for 2018. Based on what I found in Baseball Reference, he hasn't played in the field for the last couple of seasons, so his hitting position is only "DH"
He may not show up in all player screens yet - I need to rewrite some code that's geared to look for only pitchers or only hitters. Fall Trading Period #2 - Results Posted. That's it for trades this fall. The next deadline is Sunday, January 7 to cut your rosters down to 28 or fewer players. All positions are final - I've finished verifying the positions of minor league players. These players were switched between hitter/pitcher designation: Jordan Schafer switched back to OF; Anthony Gose, Ike Davis, and James Jones are flipping from hitters to pitchers. New players will be added for 2018 later this week or this weekend. Extension of the deadline when your carryover choices are due - you'll need to cut down to 28 players by Sunday, January 7 (midnight EST). First step before you can do any trading or pick your carryover players - indicate if you're keeping each of your teams in 2018. You must answer "yes" before you may submit any trades or before anyone can contact you for trades. Deadline is December 16 or we assume the unanswered teams become Orphans. Team payment due for 2018. Reminder, if you're paying for single teams you can save $5 per team if you pay by December 17. Fall Trading Period #1 - Results Posted. The 2nd trading period is now open - Deadline is Sunday night, Dec. 17 at midnight Eastern time. Players of the Year are final - teams that earned bonuses for those awards will have that cash credited when I process trades (either later Monday night or on Tuesday). Don't forget to let us know if you're keeping each of your teams in 2018. You must answer "yes" before you may submit any trades or before anyone can contact you for trades. Deadline is December 16 or we assume the unanswered teams become Orphans. Save 10% - Black Friday through Cyber Monday - Season Tickets are $265 instead of $295. Play as many teams as you want in 2018 for less than the normal price of 6 teams. Offer good November 24 - 27. Players who have positions with an "x" at the end still need to be verified - it will probably be mid-December until that's complete. You can check your total payment due for 2018. Reminder, if you're paying for single teams you can save $5 per team if you pay by December 17. Trades are now open - you have until December 3 for the first trade session. The second session will extend through Dec 17. You can also begin choosing your carryover players - visit your team roster(s) for a link to do that. Final deadline is January 2, 2018. Positions updated for 2018 - these are final, except for where you see an "x" in the position or secondary position - these players are not yet verified (and some may be removed from the game for 2017). Teams have been given their 2018 cap cash (the actual distribution is enough to get the team in your league with the smallest cash balance up to the cap level). Bonuses for Players of the Year are still to be awarded. Bonus teams have been awarded - as orphans appear or new leagues open (later this week), you can begin using those bonus teams. So Jesse Roche will be the champion - the suspense will be whether Crumpton gets its 2nd Bash championship or whether The Natty Lights gets its first. Jesse has won the Bash 3 times before with 3 different franchises. Final Result: The defeated Crumpton 4-1; Congratulations Jesse! Benchwarmer Bash - Bash Semifinals Games 1-7 posted. 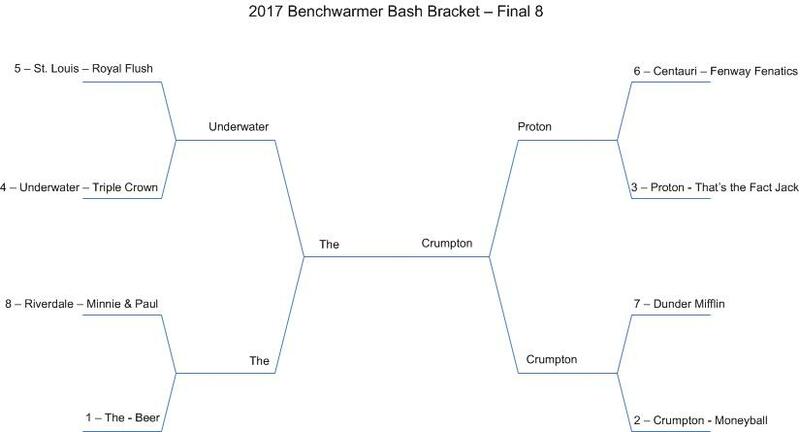 We'll wrap up 2017 with the Benchwarmer Bash finals on Saturday. Benchwarmer Bash - Bash Quarterfinals Games 1-7 posted. Benchwarmer Bash - Federation Finals - Games 1-7 posted - The winners move on to the Benchwarmer Bash - games start on Wednesday Thursday. In the Federation Semifinals, there's a meeting of two teams from the Batman League - League champ Infinity Island and wild card and #1 seed Kersh & Trouty. Infinity Island swept all 6 of their games in the regular season. Benchwarmer Bash - Federation Quarterfinals - Games 5-7 posted. Semifinals might not begin until Sunday morning. Benchwarmer Bash - Federation Quarterfinals - Games 1-4 posted. Player salaries updated for 2017 - these are NOT YET FINAL Premium salary adjustments are yet to come. Positions updated for 2017 - these are final, except for where you see an "x" in the position or secondary position - these players are not yet verified (and some may be removed from the game for 2017). There's one more chance for lineup changes - for any team that's involved with the Benchwarmer Bash you can set lineups for the whole run of the Bash. Deadline is Thursday night, November 2 at midnight Eastern. The possible entrants for the Benchwarmer Bash are posted - as the league championships play out, the brackets will be updated. A few wild card teams are already guaranteed a spot. Winner Crumpton Roches (Moneyball, Jesse Roche) won the division but lost in the conference title - however, Crumpton has the #1 Power Rank in the Eckersley Federation and will advance to the federation playoffs as a wild card. Runner up Oklahoma Gushers (Bleed Dodger Blue, Tom Twomey) won the division and is still alive for a league championship. Week 2 games will likely start posting on Sunday. Lineup changes for Week 2 of the playoffs are due Saturday night at midnight Eastern. 59 of the division winners from last season finished below .500 in 2017. From the 196 divisions that existed in 2016, 43 division winners in 2017 are franchises that never before won a division title. Of the 49 league champions in 2016, 25 of them repeated as division winners. (31 of 44 repeated in 2016). This season, there were 7 divisional ties. In 2016, again 7 divisions ended in ties - how did those teams in last year's tiebreaker games fare this season? Pitching matchups posted on the playoff schedules - Look for the first playoff results late tonight! - you can find the schedule from a link on your league's home page or go to Playoffs for All Leagues and click to your league from there. Week Twenty-six Transactions posted - Week 27 deadline - for setting lineups for the 2nd week of the playoffs - is Saturday night, Oct 27, at midnight EDT. Seven division ties to break - Results are in!! Brinkley has won the division 5 times, most recently in 2015 and was league champ in 2012; Liverpool has never won the division, finishing 2nd 4 times including missing by 1 game to Brinkley in both 2012 and 2011. Liverpool swept games 148-150 to force a tie and took 5 of 6 in their head to head matchups over the final 2 weeks. Kingfisher has won the division the last 6 seasons and 7 overall - it won the league championship in 2011; Pittsburgh was the last non-Kingfisher team to win - taking the division in 2010. Gettysburg won the division once - in 2007; Supersonic has 3 division titles, most recently in 2014, and won the league championship in 2008. Week 26 Deadline for lineups (and cuts/IR moves) is now Saturday, Oct. 21 at Noon Eastern - this is for Playoffs, Week 1. The regular season will wrap up this weekend, then I'll need a few days to set up all the playoff brackets. You will have an option to reset the lineups again for Week 27 - the 2nd week of the playoffs. Deadline TBD. I am now out of the country until Sept. 30. Week 25 transactions/lineups are due as scheduled on 9/20, and they'll be processed during the first week of October. We'll pick up with Week 24 games when I return. Playoff lineup deadlines will be set when we get closer to finishing the regular season games. I will not be able to make any website changes/fixes - and will have only limited email access - so there may be no communication again until after 9/30. There was a problem with the box score feed from the games on Sept 1 for the doubleheader between Cleveland and Detroit. The service accidentally duplicated the box from game 1 and published it as game 2. A correction came out and my stat collection process found this and fixed the batters' stats. What I didn't realize is that the pitchers were messed up too. All the Game 1 pitching performances were duplicated for Game 2. This means that Boyd and Carrasco were added into the stats twice. In a very few situations, it looks like these duplicates were used in BWB games. Any remaining duplicates have been deleted. Also, the Game 2 starters - Farmer and Clevenger - were NOT added into the start queue, so those stats might not have been available when needed. Those stats will get added into the start queue now. However, BWB will not go back and fix any affected games - along with the relief pitchers in play those games, it's almost impossible to go back and find what might be wrong. I apologize - and there are some mechanisms in place to discover these situations, but this was a unique problem that I wasn't prepared for. This is covered in rule 6.2 about correcting mistakes. The final 3 weeks of games are all within your division - so plenty of opportunity for many of the division races to tighten up or swap leaders. 18 games to go! Reminder - Week 24 is the FINAL week to sign any free agents for the regular season or playoffs. Deadline is Wed 9/13. Week 25 is only for cuts/IR moves. TRADE DEADLINE!! - Thursday night is the last chance to make trades this season. Every 5 weeks we shift the deadlines to better match the MLB schedule (we play 6-game weeks, while MLB teams often have 7-game weeks). So for Weeks 21-25, our deadlines for lineups and transactions are now on WEDNESDAY. With that, I had a request for a deadline extension - so your Week 16 transactions and lineups are now due FRIDAY at 2 PM Eastern (this is before the first game of the day on Friday - so no difference in games between that and midnight Pacific on Thursday night). Every 5 weeks we shift the deadlines to better match the MLB schedule (we play 6-game weeks, while MLB teams often have 7-game weeks). So for Weeks 16-20, our deadlines for lineups and transactions are now on THURSDAY. Now that we're past one major season milestone (1st round draft picks added), what's coming up that you should be tracking? - See the season schedule for details. Week 16 - deadline Thursday 7/20 - your chance to rearrange your starting rotation without concern for number of days of rest between Weeks 15 & 16 - our "All Star Break"
Week 17 - deadline Thursday 7/27 - final week to sign player contract extensions for 2018. See the extension page for information including rules or tips, or just go straight to the contract submission form. First round draft picks of 2017 are now in the player list. You can sign them this week. There is a slight risk in signing draft picks - if the player does not sign by the MLB deadline (July 15), the player is immediately removed from your roster and from the BWB player list. How to find the picks? On the player selection screen, use the "Other" filter and you'll find an option for "First Round (2017)"
So the first week to sign them will be Week 13 - with a Friday, June 30 deadline. That gives you a couple weeks from now to figure out who you like. Every 5 weeks we shift the deadlines to better match the MLB schedule (we play 6-game weeks, while MLB teams often have 7-game weeks). So for Weeks 11-15, our deadlines for lineups and transactions are now on FRIDAY. We've reached the 1/3 mark of the regular season with Game #50. Every 5 weeks we shift the deadlines to better match the MLB schedule (we play 6-game weeks, while MLB teams often have 7-game weeks). So for Weeks 6-10, our deadlines for lineups and transactions are now on SATURDAY. A couple of rule changes - one codifying how BWB will run orphan teams at league creation, another one rewards long-term private leagues with reduced rates beginning in 2018. Around BWB is a quick look around all 54 leagues to see which teams and owners are having good and bad seasons. Probably doesn't mean much this early in the season, but it's worth checking out as the season goes on. From here on out, transaction order is based on standings. Because of the timing of our game weeks compared to transaction weeks, there's a 1-week lag: the Week 1 standings determine the transaction order for Week 3, etc. It also takes a lot more time to do early in the season because there are so many ties to break. Week 3 transaction order is now current. Payment is due by the Week One transaction/lineup deadline - do we have a record of your payment? Teams not paid by Monday at 1 PM will have transactions locked. This is fantasy baseball 365 days a year. Teams worked throughout the winter and spring to get their rosters into order and are now getting ready to finalize their lineups and rotations to be ready for the first week of the regular season. We don't have any new leagues open anymore for 2017. But, if you'd like to attempt to turn around a struggling team, this final orphan team is available...pick up an existing team and rebuild it, rather than start from scratch. Orphan teams are also just $35 - about 1/2 the normal price. April special - orphan teams are free!!! Are you already a BWB team owner and want to add teams? Check first to see if you have an available bonus team from 2016 or else add new teams here. Email us if you want an orphan team and we'll set you up. We have some late-drafting leagues - so the Week Zero deadline for transactions is pushed back to Tuesday night, April 4, at 7 PM Eastern. The startup draft is now complete! The league enters the normal weekly transaction cycle - with the deadline on Tuesday night. There will be no more league startup drafts this season - we're locked in with what we've got. Broadway League will not run but we can try it again next year as a live draft. We're getting close to the wire for the final touches on your rosters heading into the season. The startup draft is now complete! The league enters the normal weekly transaction cycle - however, we'll wait until after Sunday night's deadline. After some early feedback and some rethought on my part about how I'd like it to run, the live drafts will not be auction format and will instead be snake drafts. See the rules for the live draft - this should answer most questions that have come my way the last 24 hours. We're going to try something new in 2017, or at least try it again - LIVE DRAFTS - Check out the new league schedule for 2 leagues I'm setting up to draft live - there are notes on that page about the format and check your email for more details. Season schedule and deadlines updated with 2017 dates! Made a mistake on calculating percentage of games at each position to determine secondary positions (this has probably happened for a few years) that didn't account correctly when players are at multiple positions in the same game. This only affected one player this season as it turns out - Jose Ramirez (Cle) now is eligible at 2B. The startup draft is now complete! The league enters the normal weekly transaction cycle (transactions will open up after we process the weekly transactions for the rest of BWB that had deadline on Sunday 2/19). We move on now to regular weekly transactions, including free agent signings, cuts, and trades. Contract extensions begin in March. Off season deadlines are each Sunday at midnight EST - so this week's deadline is Sunday, Feb. 19 at midnight EST. A League About Nothing Draft - Unique picks posted and a listing of how many teams picked players contested by multiple teams. Next deadline is Sunday night, Feb. 12 at midnight EST - we'll post all 3 remaining rounds of the draft after that. Dae-ho Lee returned to play in Korea and has been removed from the BWB player list. He was removed from all rosters immediately, with no salary rebate. Transactions page is now working so you can view your league's signings in the first round of the Redistribution Draft. You can also see all your signings for all your teams on one page. Due to the unfortunate death of Yordano Ventura, he will be removed from the BWB Player List and all team rosters at the time we process the first round of the Redistribution Draft. Based on Off Season Procedures Rule 12.11, any team that had Ventura on the roster will receive a 100% rebate of his salary. Rule Change - for 2017, rosters will be modified to a 4-man taxi squad instead of 2. The rules pages should all be changed - it will take a little while to modify all the roster warnings for roster sizes throughout the site. The warnings for Phase One draft pages should now be current with the new rule. Oh - hey - I forgot to reset the transaction order for the draft - it's now correct and ready for the Redistribution Draft - all the league champs draft 16th, runners up draft 15th, and the other two division winners go 13th & 14th. Unique picks posted and a listing of how many teams picked players contested by multiple teams. The 2017 Redistribution Draft is now open. You'll have 3 weekends to make your selections (see the link on your team roster). Deadline is Sunday night 1/22/17 Midnight EST. Then we post the results of only Round 1 only - any drafted players will be removed from the remainder of your lists. Tiebreaker bids now must come out of your starting cash, since there is no longer a "Phase 2 cash distribution"
A team that wins a tiebreaker auction bid now only has to pay enough to beat the next-highest bid, not the full amount that was bid. Check the legal carryover status of all your team rosters. This link is also available on the multiteam tools page.